If you do NOT want AutoFill to consider your Helpers' "prefer" and "dislike" help time preferences or Position preferences, you can choose to ignore them any time you AutoFill. There is no downside to having helpers enter their prefer and dislike times since they do not affect any existing shifts and you can choose to ignore them when you AutoFill. We normally recommend that you allow helpers to set their prefer and dislike times, but if for some reason you do not want them to see or be able to set their own help time preferences, you can turn off this ability on your SETTINGS>Global Helper Permissions page. Check the box next to: Ignore helper "prefer" and "dislike" preferences and/or "position preferences"
The Edit Shift window when you are looking for a replacement. You will see the helpers listed by availability and preferences and by clicking the Availability Chart. The Availability schedule view shows shifts and also shows the help time preferences for each day for each helper. Note you can always track how and when a schedule was AutoFilled using the "Schedule History" link at the lower right of all schedule weeks. 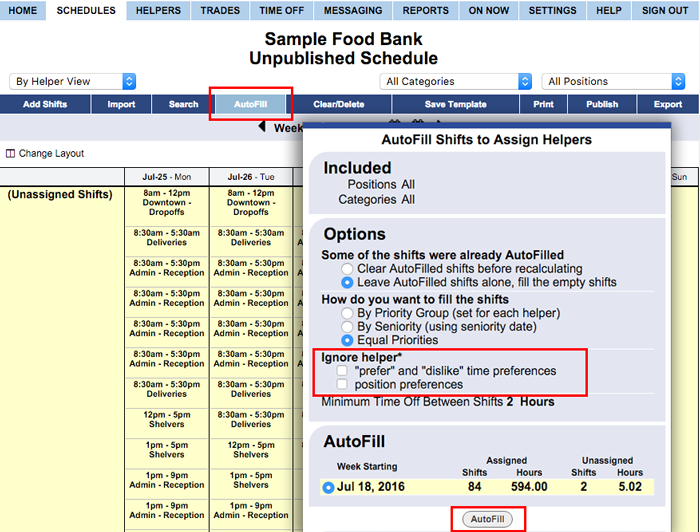 You also can compare any schedule to the current helper help time preferences and constraints using the Analyze feature.